Heading to Athens soon? Here’s your cheat sheet for navigating the Greek capital like a pro. As a former resident of the city, I’ve included my top 12 travel tips to know before you go. Hopefully these tips will help your trip to go smoothly. 1 How do I get to central Athens from the airport? 2 What’s the best way to get around Athens? 3 How do I get a taxi (without being ripped off)? 4 Where can I find out about strikes? 5 When is the best time to visit? 6 How do I get to the port? 7 Where is the bus station? 8 Where is the train station? 9 Where can I get a Greek SIM card? 10 How can I avoid pickpockets? 11 What are the dodgy areas I should avoid? 12 What about the toilet paper thing? HOW DO I GET TO CENTRAL ATHENS FROM THE AIRPORT? Athens International Airport (also known as Eleftherios Venizelos Airport) is the main gateway to the country, so chances are this is where you’ll arrive to Greece. The airport is pleasant, shiny, and not too big. 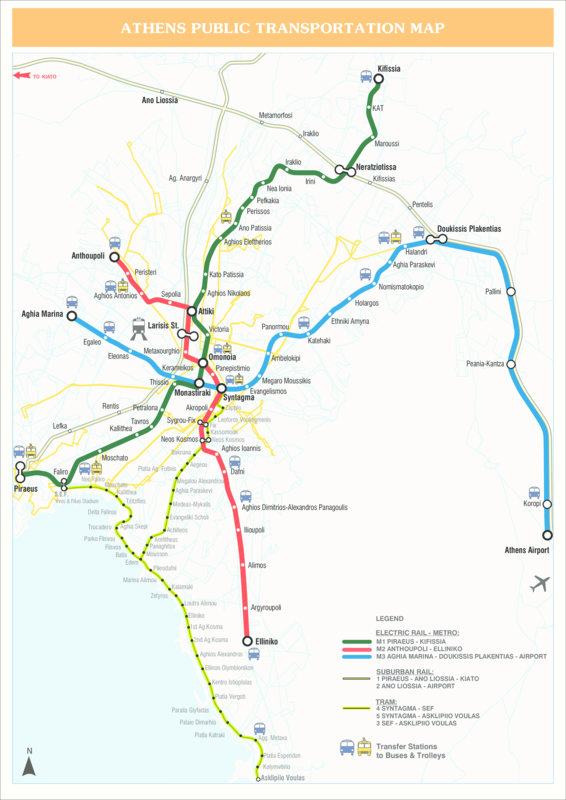 The easiest way to get into the centre during the day is by the metro which takes you straight to the centre on line 3 (red line); the main central interchange is Syntagma. Airport metro trains take approx 40 mins and leave every 30 mins (roughly between 6am and midnight, depending on the day/direction, here’s the timetable in English). Ticket price is €10 one way. The metro is quick, clean and convenient, however the airport buses are a few euros cheaper than the metro at €6 one way. X95 travels between the airport and Syntagma Square. X96 connects the airport with the port of Piraeus. X93 connects the airport with the KTEL long distance bus terminal at Kifissos. If you’re a first-timer in Athens and arriving at night then I recommend getting a taxi. There’s a flat rate to the city centre of €38 during the day and €54 between midnight and 5am. The centre of Athens is small and walkable. Picture the main zone as a triangle formed by the metro stations Acropoli, Monastiraki and Thissio. The Acropolis hill (just one of many hills in the city) is in the middle of the triangle. The main areas of central Athens are: Plaka, Syntagma, Thissio, Psyrri, Kolonaki and Gazi. You’re unlikely to wander far outside these areas unless you have an Airbnb booked in the ‘burbs, or are heading for the marina or beach, but if so then hop on the metro or the tram. Check out this image for a full map of public transportation in Athens. There are 3 metro lines—red, blue and green. The metro is shiny and new, with big breezy stations and A/C. Infinitely more pleasant (and much smaller) than London, Paris or New York. Some stations even display ancient artefacts, like an underground museum. Signs and announcements are in English as well as Greek. Athens has recently introduced a new plastic smartcard (a bit like London’s Oyster card) called the ATH.ENA card for public transport in the city. You can buy one at all stations. One standard 90-minute journey costs €1.40, but for a full list of fares (including the 3-day tourist ticket) see here. Metro, tram and train timetables are here. Local bus timetables are here. Athens taxi drivers have a bad reputation and are notorious for overcharging and scamming tourists. Many don’t speak English too (or at least pretend not to). At least that’s how the story goes. Actually my experience with taxi drivers has always been great. You get some cracking stories. Sometimes it seems like 1/3 of the city’s population became a driver during the economic crisis. And taxis in Athens are relatively cheap. The trick is to avoid avoid hailing taxis in the really touristy areas if possible. Make sure the taxi is on the meter if you do. But I really recommend you download the app Beat; it’s the local equivalent of Uber (which isn’t really a thing in Athens as most drivers boycott it). It’s easy to use and you can request an English-speaking driver. Even if you don’t plan on using taxis a lot, it can be handy in case of strikes. HOW CAN I FIND OUT ABOUT STRIKES? Athenians like to exercise their democratic right to strike. Particularly during tourist season. Including taxi drivers. It’s just something that you have to take in your stride, and is one of the reasons that tight schedules are not recommended when travelling in Greece. Sometimes the strikes are announced very last minute. Sometimes they’re accompanied by demonstrations and road closures. There are a few dates when you can almost definitely expect strikes: 1st May, 17th November, 6th December. It can be hard to find timely information on strikes in English. The best resource I’ve found so far is: Livin Lovin Greece – Strikes and Work Stoppages. Do let me know if you find something better. WHEN IS BEST TIME TO VISIT? Athens is super busy during the peak summer months of June, July and August. But during August about 2/3 of the locals leave the city on summer vacation—coming to a head around the August 15th public holiday (Assumption Day). Try to avoid travelling on or around this day if possible. This mass exodus means the city feels very quiet for most of August. This is good in some ways (easy to find a seat in the good bars), bad in others (loaads of restaurants and bars are closed). Most of the tourist infrastructure remains open; its the local areas that shut down. So be aware if booking an Airbnb in the suburbs that amenities might not be open. Fall is a brilliant time to visit Athens; beautiful crisp light and dwindling tourist numbers, but still warm enough to be outdoors. Crowds start to ease from the end of August onwards, though the summer tourist season keeps running until roughly mid-October when the islands and beach resorts shut down (weather dependent). I love the vibe over the winter months as the weather is usually mild and sunny, and all the seasonal workers who’ve been on the islands over the summer have returned for the winter. The city has a great buzz with lots of live indoors music (although beware the cigarette smoke). My hardy English skin has hit the beach in February. The Acropolis is closed on 25th and 26th December, and 1st January. Easter can be tricky as the city pretty much shuts down for a week, catching many tourists unawares as the Greek Orthodox Church follows a different calendar to Western Christianity. The Acropolis is closed on Easter Sunday and May 1st. Carnival is great fun though; Smokey Thursday particularly amazing for carnivores. Here’s a list of national holidays in Greece, and opening info for the Acropolis. WHERE IS THE FERRY PORT? First you should know that there Athens has three different ports: the main port Piraeus, secondary port Rafina, and little Lavrio. Piraeus is the biggest, closest, and by far the easiest to get to by public transport as it’s on the metro (end of the green line), something to bear in mind when choosing between ferries. I know many people who have been caught out by the lack of public transport to Rafina early the morning. If your Rafina-Mykonos is at 7am then a pricey taxi ride is your only option. During the day you can catch a KTEL bus to Rafina (1hr) or Lavrio (2 hrs) from the Pedion Areos bus stop near the Victoria metro station. There are also KTEL buses direct from the airport. The most accurate resource for ferry timetables is GTP although Ferries in Greece wins on usability. Each region runs its own bus company under the KTEL umbrella and there’s no central website making accurate online information difficult to come by. Furthermore, there are 3 bus stations in Athens—all in different parts of the city and not linked so make sure you’re heading to the right one. It’s best to check locally for up-to-date information. Pedion Areos. Nearest metro is Victoria. Terminal A – Kifisos. Nearest metro is Eleonas. Terminal B – Loission. Nearest metro is Kato Patissia or St. Agios Nikolaos. Greece does not have an abundant rail network. That said, it has been upgraded in the past decade. The main routes from Athens are north to Thessaloniki, or west to Patras. Athens Railway Station is located at Larissa, where it connects with the red metro line. The main phone networks in Greece are: Cosmote, Wind, and Vodafone. Getting a prepaid SIM card in Greece can be a bit of a pain as the country has a limited number of phone numbers. You’ll need to hand over your passport (required by law). Sometimes the smaller stores claim that they’ve run out of SIMs so they can try to flog you a pricier bundle or point you to a bigger store. Staff in the stores are not always helpful and the packages confusing. The easiest store to find is the large Cosmote on Syntagma Square. You can also try the Post Office, or any Germanos or Public store. There is a Public in the airport however it’s unhelpfully in the Departures Lounge. No need to buy a SIM if you have an existing plan from another EU country, you should be able use your plan as at home. You can buy top up cards from the kiosks that you see on every street corner. HOW CAN I AVOID PICKPOCKETS? Athens has a reputation for pickpockets, although no more so than any other big city. Keep an eye on your belongings and take the usual precautions, particularly in the main metro stations and busy tourist areas such as Monastiraki Square. Go somewhere discrete to get your phone out. Don’t be distracted by people trying to flog you bracelets or roses. Don’t keep your wallet in your pocket. WHERE ARE THE DODGY AREAS IN ATHENS? If it’s your first-time in Athens, best to avoid booking accommodation in Omonia and Victoria Square. These areas are busy transport interchanges during the day. They can feel a bit sketchy if you’re not familiar with Athens, although I think their reputation is worse than the reality. Graffiti, a pile-up trash (often due to strikes in the summer) and a congregation of rough sleepers mean you’ll probably feel more comfortable staying elsewhere and avoiding these areas at night, although its unlikely something with happen to you unless you go looking for trouble. WHAT ABOUT THE TOILET PAPER THING? Oh yes. Don’t forget this. In Greece, you can’t flush toilet paper down the toilet. The pipe gages are just too narrow and easily clogged. Instead there are small bins next to every toilet. Bins are emptied regularly so there’s rarely a pong. Everyone forgets every now and then, but you soon get used to it. On the plus side, tap water in Athens is perfectly drinkable. Check out the top 15 things to see, do and eat whilst you’re in Athens. Found this post useful? Follow on Facebook for more.